In case you missed it, I posted my first post of 2017 yesterday, my bucket list for the year. It was actually fun for me to write that all up. But setting all the goals, and of course, reading other people's lists for 2017 and beyond, makes me realize all of the things that people seem to love to do but that will never, ever, make it onto a bucket list of mine. Or my favorite phrase I adopted from Steph, 'good for other people, not for me. Skydiving. Or learning to pilot a plane. I'm terrified of flying and I'm not great with heights either. I'll never have something on my bucket list that involves being in the air or jumping to the ground from a really high distance. Most world travel. John hates travel too so the most we do is Vegas or Disney World. Maaaaybe something tropical like the Bahamas. But never to Europe, Africa, Asia, South America, or Australia. Or Antarctica, let's get them all in. Neither of us have any desire to go. He sometimes talks about Germany (because he's German) for Oktoberfest but I don't think he could handle the flight. And personally, I've been to Germany, and India twice, and I have no desire to go back or travel to anywhere else. I suppose a tiny part of me wants to see all the Harry Potter stuff in the UK, but not enough to actually ever do it. I'll stick with Universal in Florida. I've been offered numerous trips to India, trips to Italy and Ireland, even once to New Zealand, but I turn them down every time. Run any sort of distance race. 10k, half marathon, marathon, triathlon, nope nope and more nope. I ran track and cross country in high school, I'm well-versed in all the many, many things I hate about running. It will not change. Why sign up for misery? Buy _______. I mean, anything really, but I was specifically thinking about people who are looking to buy cars, makeup, clothes, material things like that this year. I love life without a car, I find it infinitely easier, but maybe that's because I've never had one. And I just don't have any holes this year that I need to fill in terms of my wardrobe or anything like that. We're currently saving for bigger projects we want to do around the house (like re-flooring the basement, I hate carpet!) I'm actually going to see how long I can go before buying anything, except super simple groceries. It's nice to say that I've been totally successful so far this year! Never mind the fact that it's not even been 3 full days. 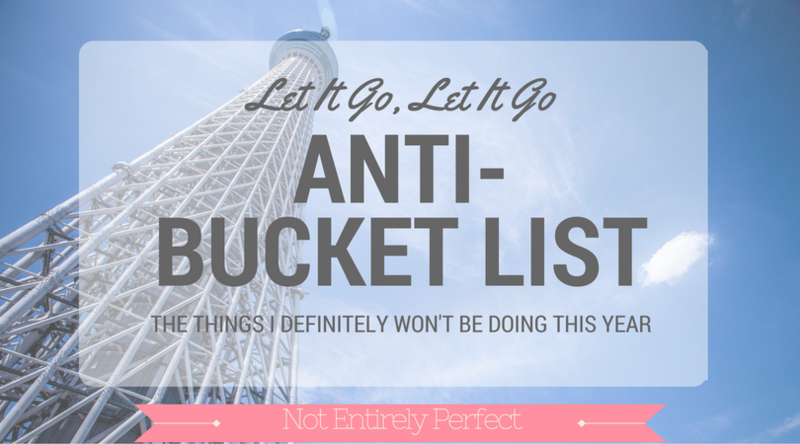 What's on your anti-bucket list this year? Or more specifically, what do you see come up on other people's goals list that you would never want to try?